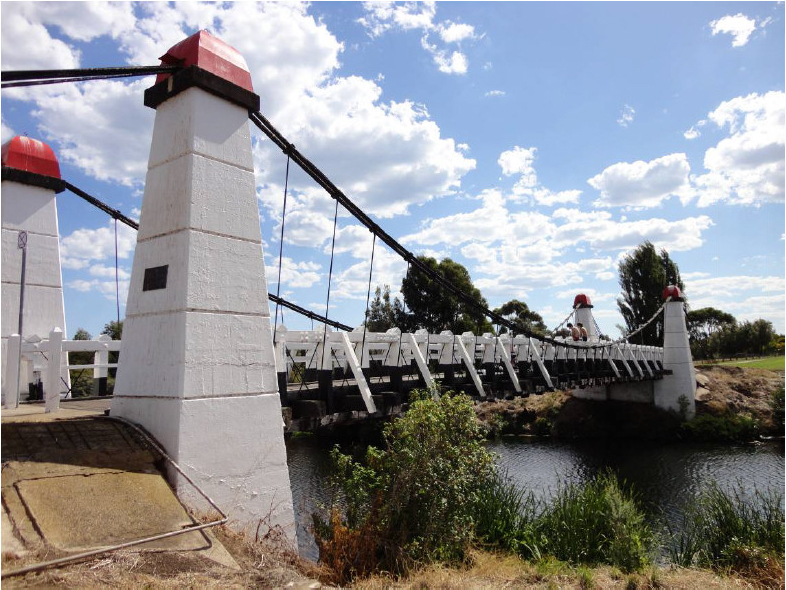 Wollaston Bridge at Warrnambool was erected across the Merri River in 1890 to facilitate access to the Wollaston Estate of Sir Walter Manifold. 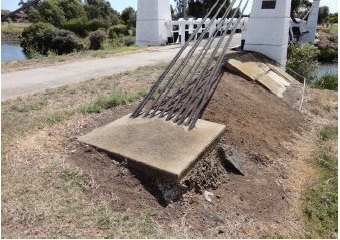 The design and construction of the bridge is attributed to Warrnambool contractor Arthur P. Dobson. In 1967 the Wollaston Bridge was by-passed by a new reinforced concrete structure located adjacent, and it is now used as a foot bridge. The Wollaston Bridge is a thirty metre long suspension bridge with a timber deck and superstructure suspended from steel cables anchored across four square tapered stone pillars to approach abutments. The pillars are constructed of stone and have cast iron caps with the steel cables passing over cast iron saddles within the pillars. The cables used in the suspension mechanism came from old Melbourne tram routes. The bridge has a timber balustrade independent of the structure. 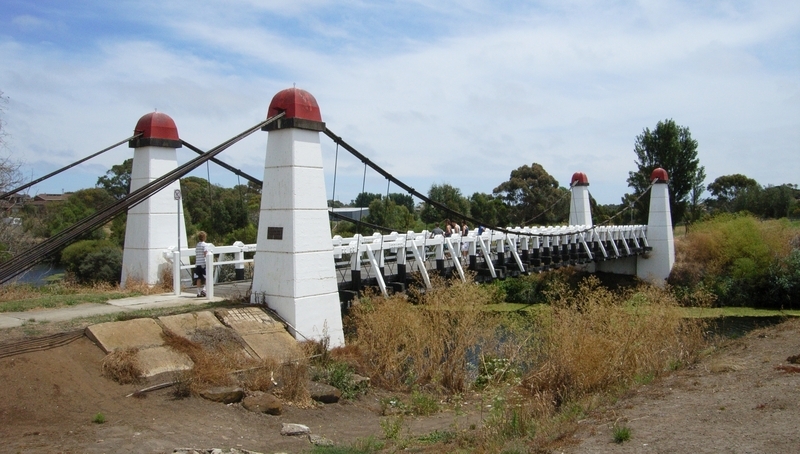 Wollaston Bridge is of architectural and aesthetic importance as an excellent and rare surviving example of a cable suspension bridge in Victoria. It is a sophisticated engineering structure of a substantial span and of notable aesthetic quality with its combination of materials including the stone pillars with cast iron capping, timber substructure and steel cables. Wollaston Bridge is of social and historical importance for its associations with Sir Walter Manifold who payed for the bridge and who managed the Wollaston property from 1885 until the end of World War One when the property was divided up for soldier settlements. Sir Walter Manifold was elected to the Legislative Council for Western Province in 1908. When Sir John Davies retired as president of the council in 1919, Manifold was elected. Knighted in 1920 he presided until 1923 when ill health forced him to retire. Wollaston Bridge is a rare example of a substantial privately funded bridge. 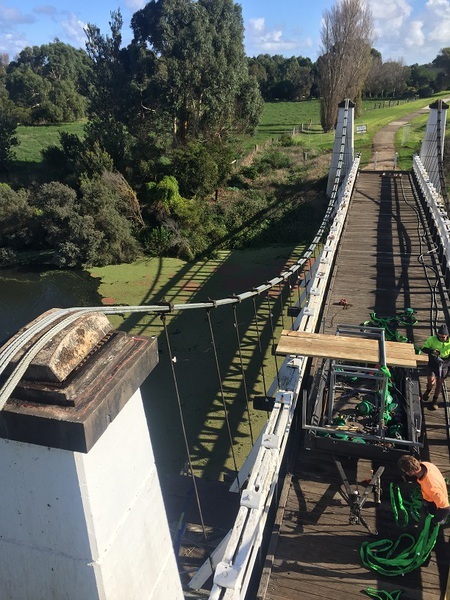 Wollaston Bridge, Wollaston Road, over Merri River, Warrnambool, Warrnambool City Council. 1. To the extent of: All the structure known as the Wollaston Bridge including all of the structure, its approach spans, abutments and suspension mechanism as marked B1 in Diagram 602301 held by the Executive Director. Walter Synnot Manifold, was born on 30 March 1849 at Grasmere, Warrnambool, Port Phillip District. He was the second son of Thomas Manifold and Jane Elizabeth, daughter of Captain Walter Synnot. He signed the roll as a solicitor in 1875 but did not practise. With his elder brother James, he bought Pine grove West Station, near Echuca. Bought Sesbiana in Queensland, entering into partnership with his uncle Peter Manifold and others. He managed Sesbiana in 1878-84, then sold out and returned to Warrnambool to take up his inheritance of Wollaston. On 23 April 1885 he married Fanny Maria, daughter of Commander Alexander Smith, R.N. Manifold bred cattle at Wollaston, but turned most of the property over to dairy farming, run on a share and tenant basis. It left him time to devote to his favourite hobbies, cattle and machinery-by 1904 he had installed an electrical plant. After World War One, Wollaston was broken up for soldier settlement. Walter was elected to the Legislative Council for Western Province in 1908. He was unofficial leader of the council in 1910-19. When Sir John Davies retired as president of the council in 1919, Manifold was elected. Knighted in 1920 he presided until 1923 when ill health forced him to retire. He resigned his seat in January 1924. A widower he died on 15 November 1928 at Toorak and was buried in St Kilda cemetery. His estate was sworn for probate at £83 356. Like his cousins at Purrumbete, Manifold had undertaken public work as a duty, imposed by his position as a leader of society and member of the pre-gold upper-class. The Wollaston Bridge is one of the most important cable suspension bridges erected in Victoria in the nineteenth century. The bridge was privately funded by noted district pastoralist and Public figure, Sir Walter Manifold and has successfully withstood the ravages of successive floods since 1890 and survives as a sophisticated engineering structure of remarkable span. It replaced and earlier timber bridge in the same position (RNE Citation). 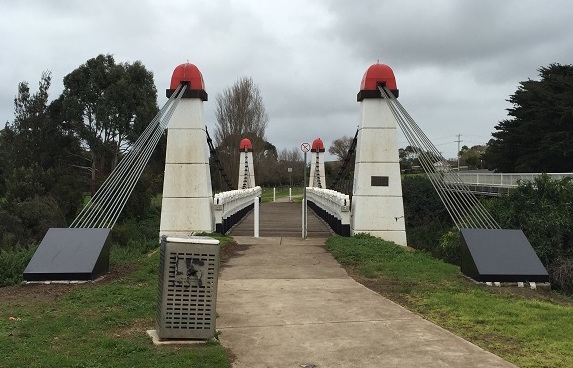 The Wollaston cable suspension bridge at Warrnambool was erected across the Merri River in 1890 to facilitate access to the Wollaston Estate of Sir Walter Manifold. 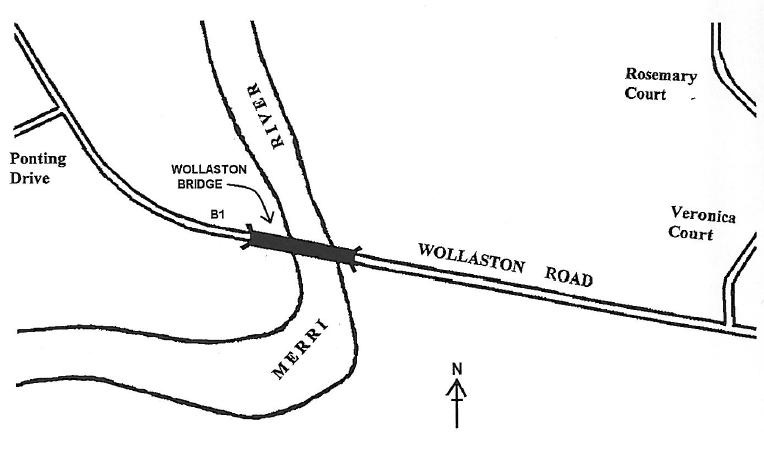 It carried Wollaston Road over the Merri River Warrnambool. 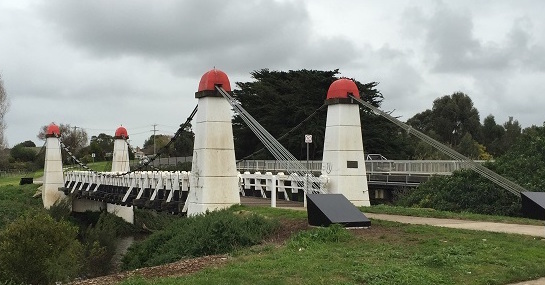 The design and construction of this bridge, which consists of a timber deck and superstructure suspended from steel cables anchored across square tapered stone towers to approach abutments, is attributed to Warrnambool contractor Arthur P. Dobson (RNE Citation). Its designer and builder Arthur Dobson was also responsible for designing the Warrnambool breakwater (Warrnambool Standard April 12, 1985 p.1). In 1966, the bridge was considered unsafe for traffic and was handed over to the National Trust in June, 1968. In 1967 the Wollaston Bridge was replaced by a new reinforced concrete structure located adjacent (Warrnambool Standard April 12, 1985 p.1). In 1985 cables were replaced on the bridge after the original cables collapsed (Warrnambool Standard April 12, 1985 p.1). Wollaston Bridge is a rare example of a small suspension bridge which was privately funded. It is a rare example of a cable suspension bridge in Victoria. Wollaston bridge is representative of engineering methods of the time and is an excellent example of a suspension bridge. It is a sophisticated engineering structure of a substantial span (30m). Wollaston bridge is an attractive landmark in the pastoral landscape. It is unusual for its use of former tram cables in its construction. It has a notable aesthetic quality with its combination of materials including the stone columns cast iron capping, timber substructure and steel cables. Wollaston Bridge is important for its associations with district pastoralist and public figure Sir Walter Manifold. 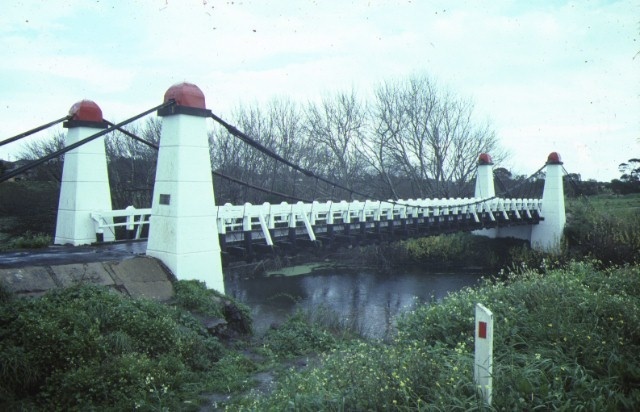 The bridge is also important for its associations with its designer and builder Arthur Dobson was also responsible for designing the Warrnambool breakwater.